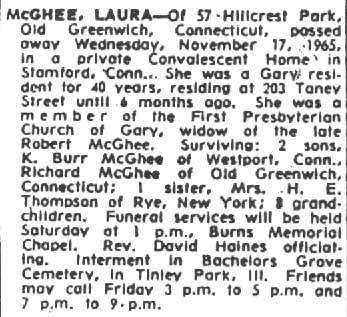 Laura M. (Moss) McGhee - Born January 8, 1887; died November 17, 1965; buried November 20, 1965 Laura M. McGhee was the daughter of Richard Edmund Moss and Maria H. Farquharson, and that Robert was her husband. The following was submitted by Dale Kaczmarek, President of the Ghost Research Society. Photograph drawn by M.J. Vucuis. Date of drawing unknown. Mrs. Delaney Ann Hulett, 66 years old, died April 16 at her home in Bremen township. Burial services were conducted April 19 under the direction of the Rev. T. R. Egerton, pastor of the First Congregational church. Burial was at Bachelor Grove cemetery. Mrs. Hulett was born in Bremen township Sept. 18, 1854. 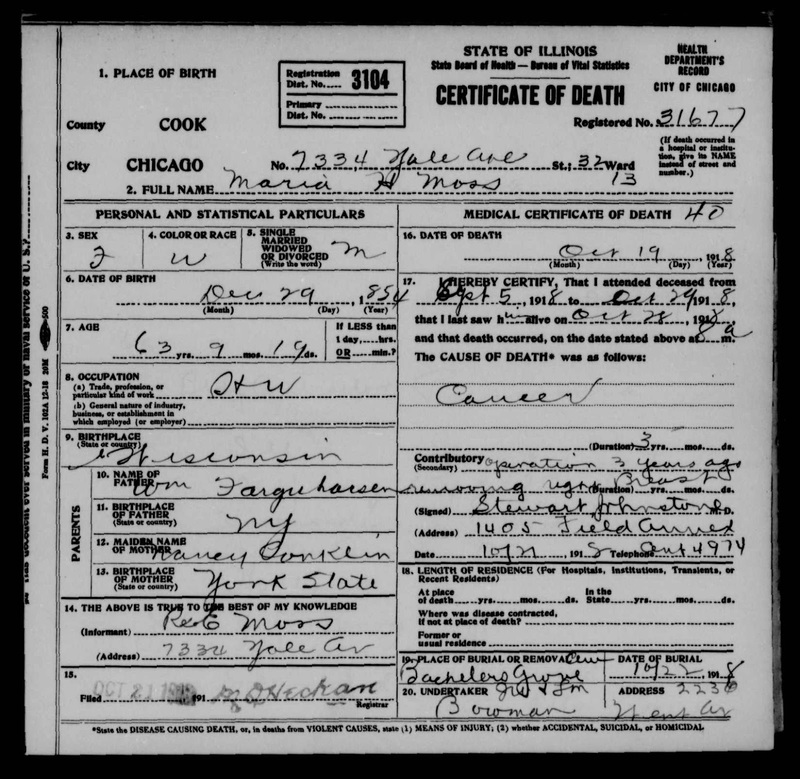 She lived in Blue Island 31 years and was a for 25 years a teacher in the Cook County schools. 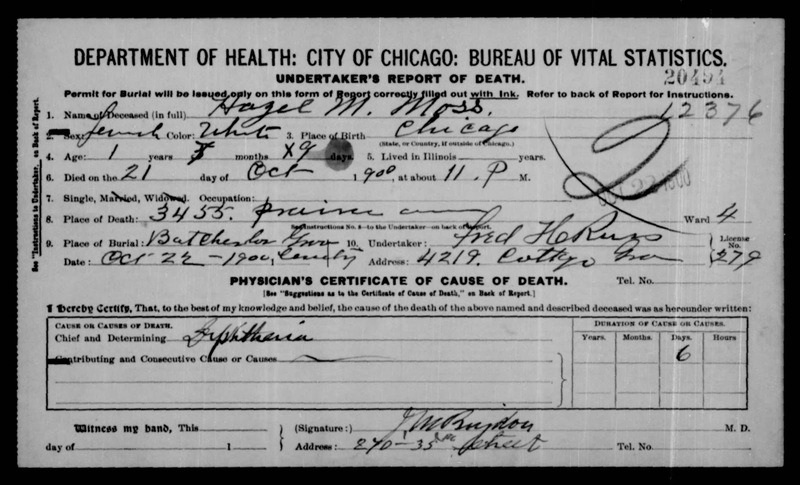 She was married in 1900 to Dr. J. W. Mckee, of Des Moines, Ia. 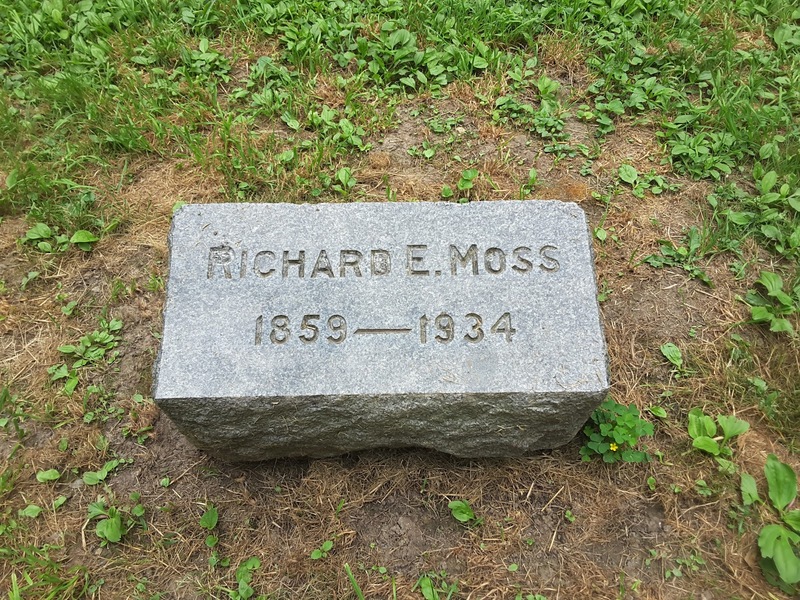 He came at once to Blue Island and the couple lived here until his death in 1911. Before her marriage Mrs. Mckee was a member of the Universalist church but she later affiliated with the Congregational church. MOSS - Richard E. Moss, March 9, at home, 7334 Yale-av., beloved husband of Alicia C. Moss, fond father of Mrs. Isabelle M. Steigely, Mrs. Laura McGhee, Mrs. Ethel Mendenhall and Mrs. Gladys Thompson. At home until Monday noon. Funeral services at Auburn Park M. E. church. Monday, 2 p.m. Interment Bachelor's Grove cemetery.